The weather is bad. 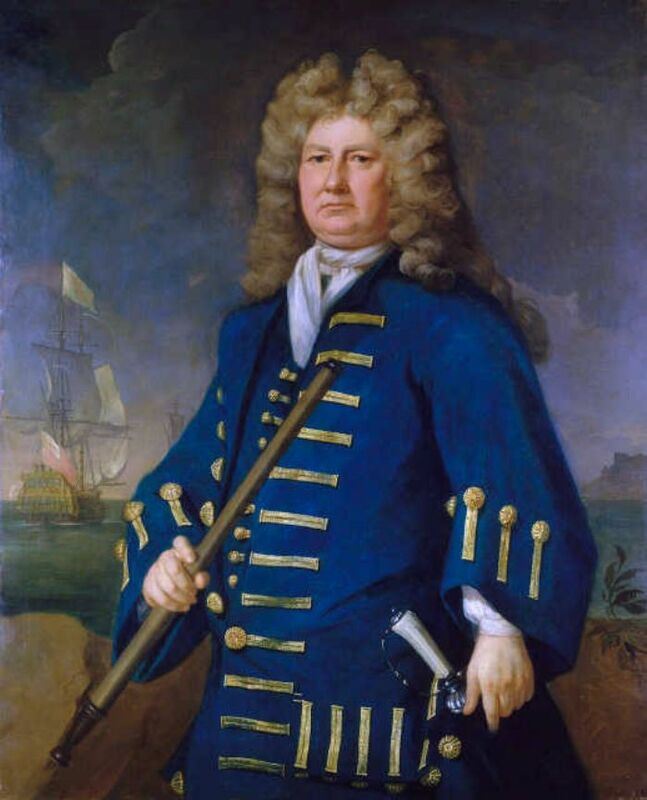 It’s coming up to 8.00 pm, and the British fleet, under the command of Sir Cloudesley Shovell, – homeward bound from Gibralter – is entering the Channel. It’s a dangerous place; always difficult to know exactly how you are placed. All day there has been nothing but cloud and drizzle, blowing in relentlessly from the south west, so how can the navigator take a sighting? The fleet must put its faith in soundings and dead reckoning. The master of the Torbay does so, then consults his almanac. All is well. The fleet is in the “Fairway to the Channel”, and should steer a northerly course. This it proceeds to do, travelling in three columns with the slower ships trailing several miles behind the leaders: the Monmouth, the St George, the Association. The weather is so murky, the going so heavy, that the ships quite lose their formation. But who are we to quibble at that, when 1400 men have only an hour to live. The Monmouth spies St Agnes beacon, its coal-burner casting a light at best five miles through the weather – perhaps the work of some nameless, sharp-eyed lookout, perhaps just the lucky chance of a break in the cloud. This ship will survive to serve another 60 years, and perhaps most of the crew will die peacefully in their beds. Not so the crews of the Romney, the Eagle or Sir Cloudesley Shovell’s great flagship, the Association. From these great ships, only one man will survive the night. The sailing master of the Salisbury, lying at anchor in the safety of St Mary’s Roads, will report distress signals piercing the darkness: “…several flashes of guns… to the number of 30 and about half an hour or more I see one more & heard a report and this morning before day being little wind, drove by us vast quantities of Ship Reck as beames, carriages, drumheads of capstones, points of masts and yards… Three being lost as we are informed her Maj’is ship Esosiation and Eagle and all their men, the Rumney with one man saved, the Firebrand fireship with Capt, Lieut, Boatswain, Carpenter, Surgeon and 15 men and boys saved”. But some good will come of this. 18th century Britain is a country confident of its capacity to progress and to learn from its mistakes. Seven years in the future, the Longitude Act will announce a £20,000 prize for the man who can come forth with a solution. So does 14 year old John Harrison, carpenter and amateur clockmaker, lie restless tonight in his faraway Lincolnshire bed, knowing nothing of the Scillies or of admirals, but listening to the first stirrings of the same storm, as it traverses the nation? This may seem fanciful. But stranger stories persist. Is it really true that no grass will grow to this day around the memorial at Porthellick? 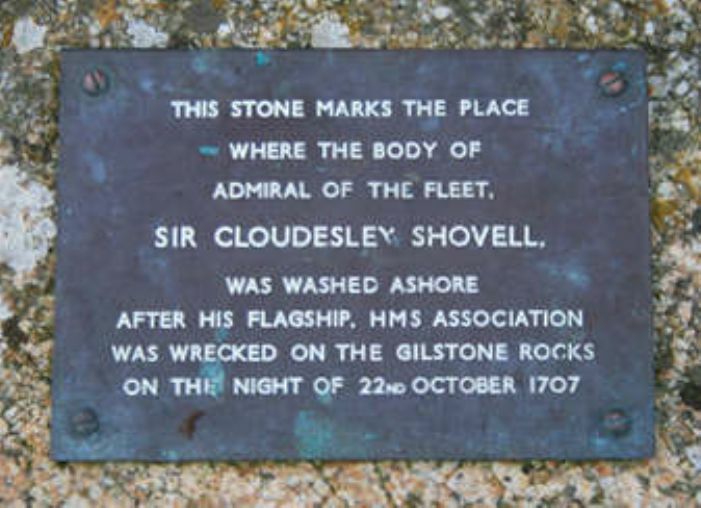 That Sir Cloudesley Shovell survived being washed seven miles from his ship and was cast up alive, only to be murdered for his emerald ring? 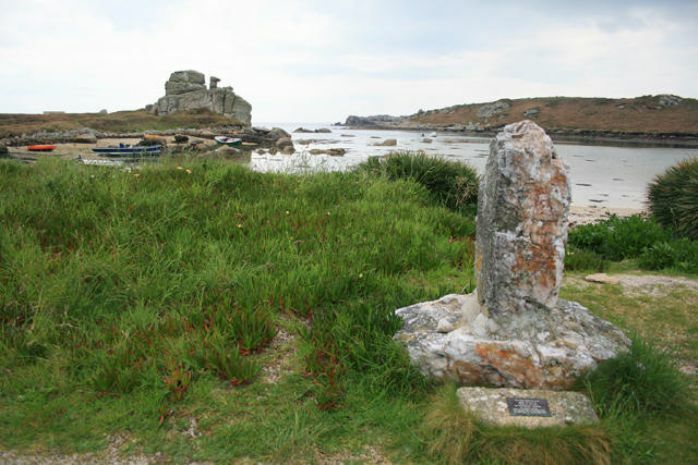 That the true position of the fleet on the night of October 22nd was discerned by an unnamed member of the crew – perhaps a Scillies man – who tried to remonstrate with the Admiral, only to be hanged at the yardarm for his pains? And – perhaps hardest to believe of all - is any remnant of the 1707 British fleet now enjoying a second life, as part of the set dressing at the Admiral Benbow, Chapel Street, Penzance?